Doctor Who: Executioner? | Warped Factor - Words in the Key of Geek. It would appear there are more similarities between the Fifth & Twelfth incarnations than were first apparent. For underneath that aloof exterior, is not the older man just as insecure as he was back when he wore cricket whites and believed in fair play? Of course all this stems from a choice he made well before then not to sink to the level of the Daleks. DOCTOR: I'm not here as your prisoner, Davros, but your executioner. 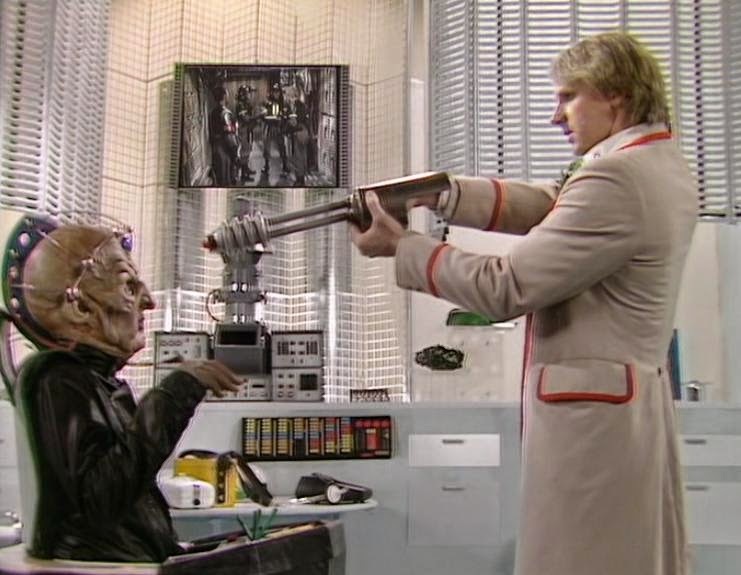 DAVROS: Listen to me.You, in your way, are not an unambitious man. Like me, you are a renegade. DAVROS: I had planned to completely redesign the Daleks. Kiston will confirm I am telling the truth. DOCTOR: And compassion? Are they to be programmed for that? DAVROS: They will learn to recognise the strength that can be drawn from such an emotion. DOCTOR: But only to make the Daleks more efficient killers. DAVROS: To make them a more positive force. DAVROS: The universe is at war, Doctor. Name one planet whose history is not littered with atrocities and ambition for empire. It is a universal way of life. DOCTOR: Which I do not accept. But of course he can't walk the walk after talking the talk. DAVROS: You hesitate, Doctor. If I were you, I would be dead. DOCTOR: I lack your practice, Davros. DAVROS: You are soft, like all Time Lords. You prefer to stand and watch. Action requires courage, something you lack. But is the at least implied shooting of a child any more courageous now that his current self has seemingly decided upon it as the best course of action to retrieve Clara, Missy & the TARDIS? And while we're on the subject of the latest adventure for the Twelfth Doctor, it cannot have escaped your notice that Colony Sarff appears to be a cross between Harry Potter's Lord Voldemort and a monster from the Fifth Doctor's era, the Mara. "It was a great idea to cast him and he will be a great Doctor. They couldn’t have gone much younger. My son said I’m not sure I’m going to like him as he’s too old, but I said ‘watch the first episode and I am sure you will love him’." "I like his portrayal enormously. I interviewed him before it went out and he had some great ideas. He wanted to do a slightly different take and his was that his Doctor wasn't entirely sure that the human race was worth bothering with. Obviously, in the end, he does but it's an amusing take." We can hardly discount the fact that current show-runner Steven Moffatt has also previously proclaimed himself a fan of the Fifth Doctor! Speaking in 1995 he infamously ripped into Classic Who, but declared himself fond of arguably the most human of the Doctors. 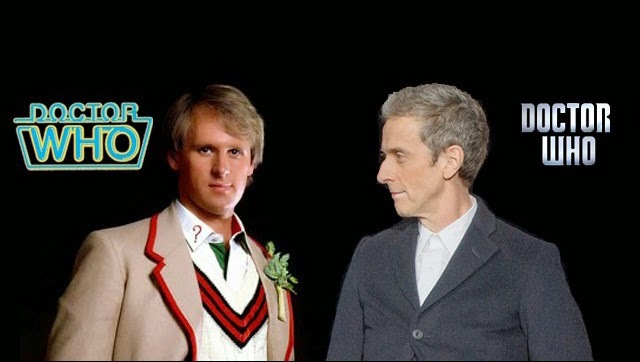 "I still think most of the Peter Davison era stands up." And indeed he considers the fifth man to have embodied the Doctor the best actor of the lot! "Peter Davison is a better actor than all the other ones. That’s the simple reason why it works better. There’s no complicated reason why Peter Davison carried on working and all the others disappeared into a retirement home. I recently watched a very good Doctor Who story, one I couldn’t really fault. It was Snakedance. Sure, it was cheap, but it was beautifully acted, well-written. There was a scene where Peter Davison has to explain what’s going on. The Doctor always has to. Now, some old actor like Tom Baker would come to a shuddering halt in the middle of the set and stare at the camera, because he can’t bear the idea that someone else is in the show. But Peter Davison is such a good actor, he manages to panic on the screen for a good two minutes, which has you sitting on the edge of your seat because you’re thinking ‘God, this must be really bad’. He’s got the most awful lines to say, but he’s doing it brilliantly." And Moffat was similarly full of praise for Capaldi upon his unveiling. "I’ve made many mistakes. It’s about time that I did something about that." It looks as though he may be about to make a start on that now! DOCTOR: Just touch these two strands together and the Daleks are finished. Have I that right? SARAH: To destroy the Daleks? You can't doubt it. DOCTOR: Well, I do. You see, some things could be better with the Daleks. Many future worlds will become allies just because of their fear of the Daleks. SARAH: But it isn't like that. DOCTOR: But the final responsibility is mine, and mine alone. Listen, if someone who knew the future pointed out a child to you and told you that that child would grow up totally evil, to be a ruthless dictator who would destroy millions of lives, could you then kill that child? SARAH: We're talking about the Daleks, the most evil creatures ever invented. You must destroy them. You must complete your mission for the Time Lords. DOCTOR: Do I have the right? Simply touch one wire against the other and that's it. The Daleks cease to exist. Hundreds of millions of people, thousands of generations can live without fear, in peace, and never even know the word Dalek. SARAH: Then why wait? If it was a disease or some sort of bacteria you were destroying, you wouldn't hesitate. DOCTOR: But I kill, wipe out a whole intelligent life-form, then I become like them. I'd be no better than the Daleks. This for a man who's already been reliably informed that he would make a good Dalek on two occasions, conflicted over his own morality. And can he really forget what happened in the Time War? DALEK: I scanned your satellites and radio telescopes. DALEK : Nothing. Where shall I get my orders now? DOCTOR: You're just a soldier without commands. DALEK : Then I shall follow the Primary Order, the Dalek instinct to destroy, to conquer. DOCTOR: What for? What's the point? Don't you see it's all gone? Everything you were, everything you stood for. DOCTOR: All right, then. If you want orders, follow this one. Kill yourself. DOCTOR: The Daleks have failed! Why don't you finish the job and make the Daleks extinct. Rid the universe of your filth. Why don't you just die? Of course, after the cliffhanger we witnessed last weekend it means the Doctor's now in a position to become their executioner. How this will play out in The Witch's Familiar remains to be seen. But it's an interesting scenario, no?